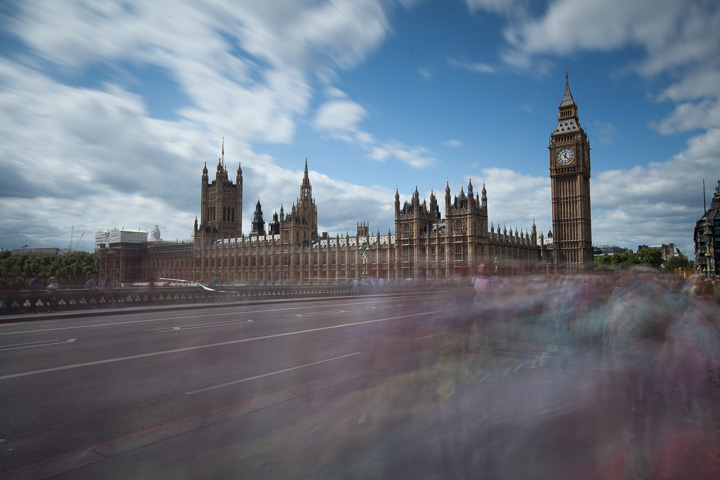 A few years ago I bought a Lee Big Stopper (US, UK, GER*), which is an extreme neutral density filter. If you try to look through it, you will see nearly nothing. 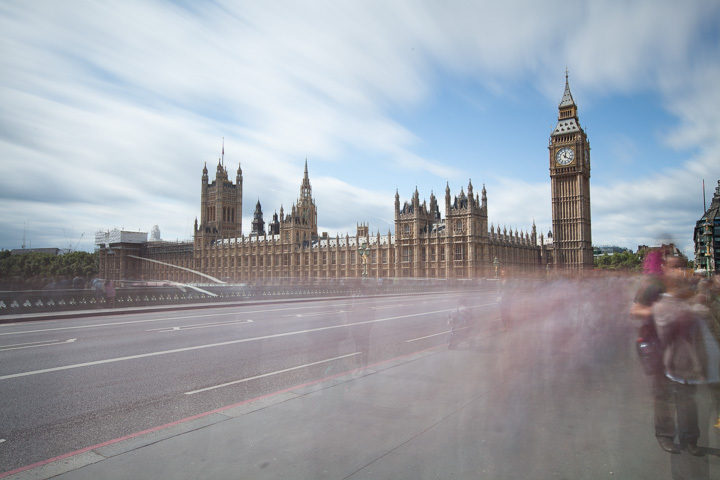 But if you put it in front of your camera lens, you can take long time exposures even during a bright and sunny day. This opens up very interesting photo opportunities when you would usually leave your camera in the bag. 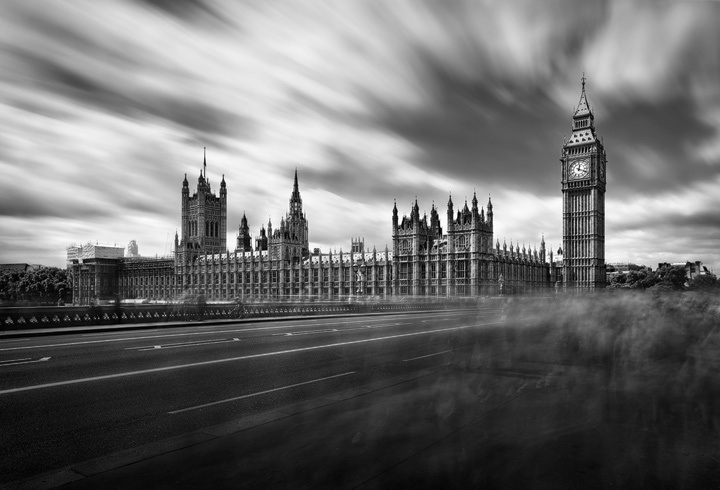 During a recent trip to London I used it to photograph Westminster around noon. At this time it’s nearly impossible to get a photo without tourists in the frame. So I didn’t even try to find a perspective that would minimize the flow of people in front of me. 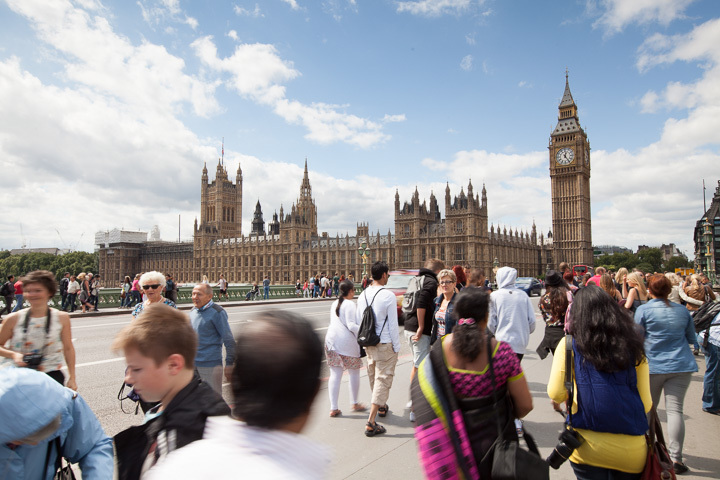 Instead I setup my tripod on the far right of the sidewalk so all people would pass between me and Big Ben. When taking photos with the Big Stopper it’s important to set the focus manually since an automatic focus would fail with the filter attached. I usually do it using Live View and then take a test shot without the Big Stopper where I try to get an even exposure. Here I applied a Lee 0.6 soft GND (US, UK, GER*) to balance the exposure of sky and foreground. I later left the GND attached in front of the Big Stopper. The exposure time of this shot gave me a first hint about the length of the exposure with the Big Stopper. It swallows ten stops of light, so I could easily calculate the exposure. A rough formula is to multiply the short exposure by 1000. Here it gave me 50 seconds. But this smoothed out the movement of the people too much so I switched to f/8 and underexposed a bit to get a more interesting foreground using a 16 seconds exposure. For the sky on the other hand I wanted much more movement. I wanted long streaks of clouds so I switched to f/13 and exposed far to the right. I didn’t do much calculation here. Over the time I developed a feeling for how long to expose. It also helps to switch on the exposure warning and to study the histogram in the preview after taking the shot. To take the long exposures I set my camera to bulb mode and used a remote release. I then kept the release button pressed for as long as I wanted the exposures to last. The resulting three photos I later blended in Photoshop using simple layer masks. I also applied some black and white processing since the colors in the foreground were too distracting and I wanted a more mystic looking image. But this is not always neccessary. 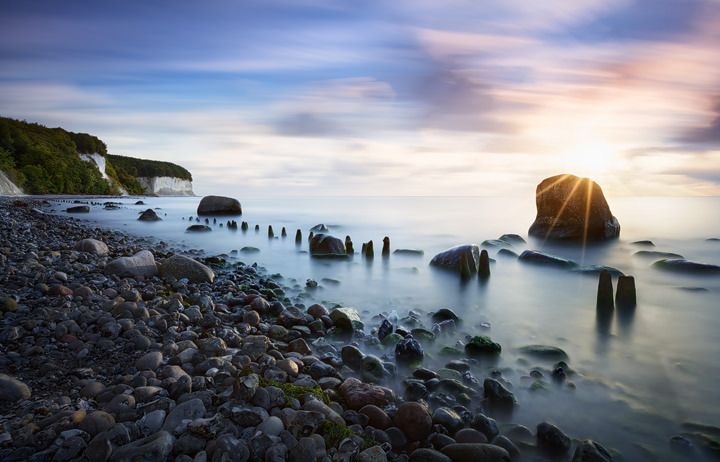 Here’s an example of a landscape photo I took on Rügen using the Lee Big Stopper. Again the final result was achieved through a combination of different exposures. Although getting such photos can be a bit cumbersome and involves patience, the results speak for themselfes. It’s exciting to wait for the exposures to finish and to see a first preview on the back of the camera.